How can one actually forget the days of the 20th century wild west? This was a time of outlaws, Sheriffs, cowboys and the mighty vast stretches of barren desert. A place where every single day was a challenge in itself, and it really did not matter whose side you were on. This period was further glorified by the release of countless movies and TV series released in the later part of the century by Hollywood. Even video games and casino title developers have tried capitalizing on the wild west theme by presenting their own rendition to the public. This has chartered the wild west theme to new heights. So one may ask, what’s this particular slot by Netent has to offer to gamblers? Well, for starters the detailing of Dead or Alive is right on point. This means the background, the sound score to the different symbols, all of which beautifully complement the title. The background presents a dark stormy sky in the desert sand, a sign of bad weather completed by a revolving weathervane and a dangling lamp. Gamblers will also see mountains in the background where they can hear chirping birds, dog barks as well as the howling wind. In terms of symbols you have a sheriff’s badge, cowboy boots, shot glasses, pistol holster, wanted posters and cowboy hats. There are also different card symbols as well within the title including A, K, Q, J and 10. Scatters: The pistol is the scatter symbol within the slot. Wilds: The wanted poster is the wild symbol here and can substitute for all the other symbols except for scatters and bonuses. This can also turn sticky during the feature. 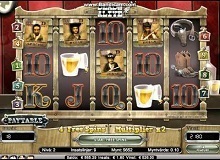 Free spins: Getting three or more of the pistol symbol anywhere on the screen triggers the free spins feature. You will get up to 12 free spins combination here which also comes with a 2X multiplier. All the wilds you manage to land during the free spins feature will become sticky. If you manage to land at least one wild per reel during the free spins feature, you are then allowed 5 extra free spins after the first 12 free spins. Players don’t have to worry here as the wilds stay sticky during the extra 5 free spins as well. One can play Dead or Alive slot machine online on a number of different casinos online today. All they need to do is register with a portal that has access to Netent’s games and then deposit a certain sum of money to start playing. 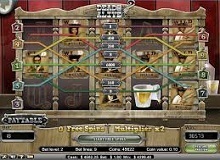 Getting the sticky wilds maximum number of time along with free spins are good tips to getting big wins. You can win up to 3000 times of your stake within the production on every free spin. So make sure to follow this strategy and target the sticky wilds while playing the title. There are no cheats available for the production. Gamblers can play Dead or Alive for real money as well as for free on their PC as well as their mobile and tablets. Your choice of the device doesn’t matter, and Netent’s games like Dead or Alive free can be played on Android, iOS, Windows as well as Blackberry phones without any hassles. 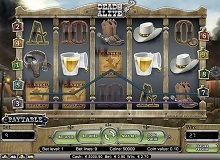 Dead or Alive slot is a high volatility game which big rollers will definitely love. You will need to ease into the title and understand its intricacies and small details. Dead or alive is something that you should definitely add in your to-do list.